Americans are downsizing. The days of McMansions and big bling are over. Today’s luxury is all about the small style, and cars are not exempt from this trend. All the players in the luxury car market are introducing pint-sized players that attempt to scale down the size but keep the opulence. Mercedes’ CLA, the BMW i3, and Lexus’ CT200h have all taken a crack at this emerging market. Not to be left behind, Audi is launching its all new 2015 A3 aimed squarely at taking the small luxury crown. I’ve driven it to the edge of its capabilities this week and now I’ve learned a lesson that women have known all along – the best things in life come in small, shiny packages. The 2015 Audi A3 cuts a remarkably more distinct silhouette than it’s predecessor. Where the last model had rounded surfaces and was generally inoffensive, the new A3 is brimming with sharp angles, shadowed areas, and aggressive stance. Also gone is the hatchback body. The 2014 model is launching with a traditional “3 box” design consisting of a small front area, a large cabin in the middle, and another small trunk area. The 2015 Audi A3 is first and foremost a 4 door sedan. The sharp angles liberally sprinkled over the entire body give this A3 a thoroughly modern look and feel, and the head designer explained to FactoryTwoFour that their positioning and rake give the car a animalistic stance and profile. Specifically, and I can’t make this stuff up, the rear wheel well positioning is designed to be reminiscent of a horse’s thigh. Seriously. Moving into the cabin, the only beastly hints are the great swaths of soft leather Audi has seen fit to drape over the many touch surfaces. Any point where your body or hand frequently rests is covered in a thick layer of cow hide, and the cockpit is a welcoming place for it. This is where Audi really needed to hit the luxury note hard, and although you’ll never mistake sitting in the 2015 A3 for an A8 it certainly stacks up against the Mercedes CLA and thoroughly trounces the BMW i3. Especially nice are the high-design AC vent controls and the instruments pulled straight from more expensive Audi machinery. 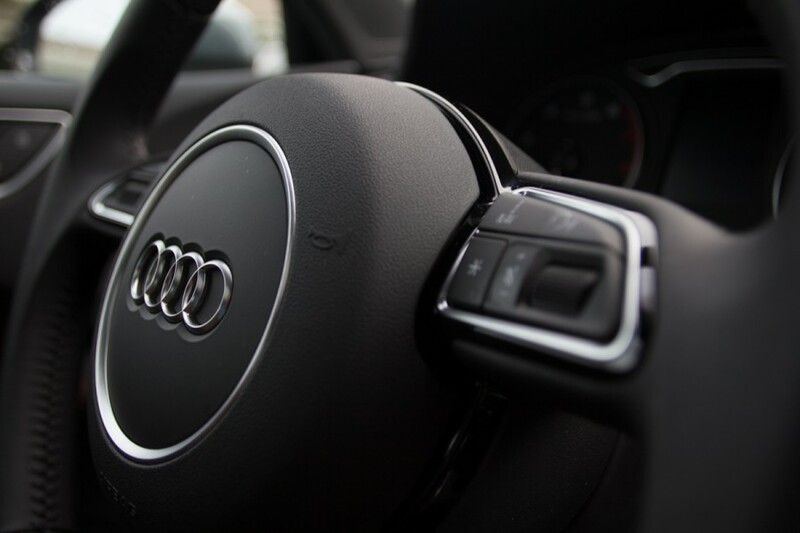 Stepping into a 2015 Audi A3 is an experience of being immediately greeted with an upscale feel that denies its small size. On the road that does not mean this vehicle is soft or ponderous. In fact, the ride is quite stiff and even sporty. What we have here is a small car with a long wheelbase, meaning stable running and a planted feel, but unfortunately also a poor turning radius. This A3 is aimed squarely at the young and upwardly mobile, and as such is planning on most of its life being spent in urban environments. This vehicle’s ride is such that I would not relish taking it up the coast on a scenic tour, but it is tailor made for zipping in and out of traffic and maneuvering into tight parking spots. The 2015 A3 is a departure and new beginning for Audi’s pint-sized warrior. Gone is the stigma of being “entry level.” This machine is just as plush and refined as Audi’s lineup that costs twice as much. The A3 is today’s Audi concentrated, reduced, and refined. This is a pure shot. This is the espresso of Audis. 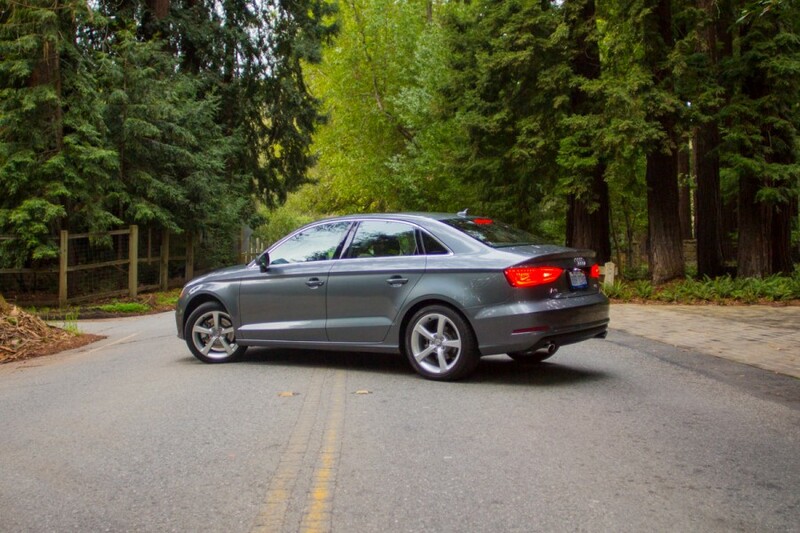 With the 2015 A3, they have showed us that size doesn’t matter, but quality does.